ca. 500 C.E. : Karaikkal Ammaiyar lived in what is now known as the state of Tamilnadu in south India. She was a great devotee of the Hindu god Shiva, and the author of four poetic works of devotion in the Tamil language to him. 11th–12th centuries C.E: Her life was described in authoritative traditional biographies in the Tamil language. 11th century on: She was depicted in metal festival sculptures originally designed for temple worship. Present: She is publicly celebrated in several annual temple festivals in Tamilnadu, south India, as well as other locations where there is a significant population of Hindu Tamils devoted to Shiva. Karaikkal Ammaiyar is revered as a Tamil Shiva-bhakti saint by Tamil people in south India and elsewhere who are Shaivas (they worship Shiva as their family deity and/or chosen deity). [See photo at right by the author; credits appear below.] The name by which she is known (Karaikkal Ammaiyar) means in the Tamil language “revered mother of Karaikkal.” Her biographers and her devotees regard the contemporary town named Karaikal in Tamil Nadu in south India as her home village. Karaikal is located nearly 300 kilometers south down the east coast of India from Chennai, and a major festival to Karaikkal Ammaiyar is held there every June–July. There are important questions of historicity concerning Karaikkal Ammaiyar that should be considered. Was Karaikkal Ammaiyar a real person? Tradition considers her to have been an historical personage who authored four poetic compositions. By the eleventh and twelfth centuries C.E., traditional biographers described her as a female person who had a special connection to Shiva. While these biographers’ lifetimes are centuries later than Karaikkal Ammaiyar’s, her biographers are much closer in time to her than we are at present. Unless there is a compelling reason to doubt or contradict an aspect of traditional memory, we may take what tradition says as a working assumption. When did Karaikkal Ammaiyar live? Scholars agree that Karaikkal Ammaiyar lived around 550 C.E. (Nilakanta Sastri 1955:35; Kārāvelāne 1982 :19; Filliozat 1982 :8, 13; Zvelebil 1973:186; Cutler 1987: 118; Dehejia 1988:135). All of the scholars point to two pieces of evidence: 1) Traditional memory places her as historically the earliest of the sixty-three named Tamil Shiva- bhakti saints; and 2) Cuntarar (Sundarar), one of the three most famous male poet-saints in the Tamil Shiva-bhakti group dating to 700 C.E., wrote a poem listing the names of all of the sixty-three saints in which his reference to one saint as “pey” (pēy; ghoul) is understood by tradition to refer to Karaikkal Ammaiyar; thus, she lived prior to 700 C.E. However, none of these scholars provide a more detailed rationale for the dating of Karaikkal Ammaiyar to 550 C.E. ; while this date is open to revision, it is plausible for several significant reasons (Pechilis 2012; 2013). Tradition views Karaikkal Ammaiyar as developing new poetic forms, and her use of them is less orderly and assured in terms of syntax and structure than later prominent poets who also used those forms, including Cuntarar, which suggests that she initiated new forms of poetry and that later poets perfected those forms. In addition, she is concerned with themes found in other Tamil literature of her time, especially the Cankam (Ca ṅ kam; academy) classical poetry (ca. 200 B.C.E. to 500 C.E.) and the narrative poems (or “epics”) Cilappatikaram (Cilappatikāram, ca. 300–400 C.E.) and Manimekalai (Maimēkalai, ca. sixth century). Such themes include the heroic ideal, the existence of pey (ghouls), Shiva’s dance, and the spiritual significance of the cremation ground. In addition, Karaikkal Ammaiyar’s poetry demonstrates familiarity with descriptions of Shiva from classical Sanskrit mythological stories, known as a genre as purana (purāṇa), which were redacted during the Gupta dynasty era (ca. 320–550 C.E.). Lastly, the kind of bhakti (devotional) poetry that Karaikkal Ammiyar produced is very different in terms of voice, structure, choice of themes and representation of bhakti compared to the compositions of the three most famous male saints (Appar, Campantar and Cuntarar, ca. 700 C.E. ); it is doubtful, given their predominance and authority as spokesmen of bhakti, that Karaikkal Ammaiyar would follow, rather than precede, them. Karaikkal Ammaiyar lived in the early period of what Alexis Sanderson (2009) has called “the Śaiva Age” in India, during which Shaivism (the worship of the god Shiva) was predominant across India, from about the fifth to the thirteenth centuries C.E. She is not the first woman to compose Tamil poetry, nor the first poet to describe Shiva in some detail; for example, at least ten poetesses contributed to the classical Tamil poetic anthology, the Purananuru (Puranānūru ; The Four Hundred [Poems] About the Exterior; dated to the first to third centuries C.E. ), and several of the poems in the collection describe aspects of Shiva known from Sanskrit mythology, including his third eye, his blue-black neck, and his destruction of the demonic triple cities (e.g. v. 55; see Hart and Heifetz 1999, xv:41). However, tradition credits Karaikkal Ammaiyar with being the first Tamil poet to have an exclusive devotional focus on Shiva. Some scholars contend that Karaikkal Ammaiyar’s aim was to replace worship of the Tamil goddess Korravai with worship of the god Shiva as depicted in Sanskrit mythology (Mahalakshmi 2000, 2011; repeated in Craddock 2010), but this perspective has some serious chronological issues, as well as a lack of thematic representation in the poetry of Karaikkal Ammaiyar (Pechilis 2012:74–75). A more fruitful avenue is to view her work as an intertextual dialogue with preceding literature such as the classical Tamil Cankam poetry and Sanskrit mythology, with contemporaneous Tamil literature such as the “epics” Cilappatikaram and Manimekalai, and with contemporaneous traditions of practice such as Shaiva Tantra. Two authoritative biographies from within Tamil Shiva-bhakti tradition were written about her within 600 years of her lifetime, celebrating Karaikkal Ammaiyar as an exemplar of devotion and as an author of devotional poetry. The much longer and more authoritative biography was written in the twelfth century by a court minister named Cekkilar (Cēkkilār), which contains biographical stories of all sixty-three named saints in the Tamil Shiva-bhakti tradition, including Karaikkal Ammaiyar. At this time, Karaikkal Ammaiyar’s compositions were canonized in the Tamil Shiva-bhakti tradition by being included in the eleventh volume of the canon of devotional literature to Shiva; this canon is called the “Sacred Collection” (Tirumurai). Cekkilar’s biographies of the saints constitute the twelfth and final volume of this canon. Cekkilar’s biography of Karaikkal Ammaiyar was enormously influential in the Shiva-bhakti community’s imagining of her. For example, the biography has had a major influence on the festival images of Karaikkal Ammaiyar made of metal created from the eleventh century on, such as the image now at the Nelson-Atkins Museum and the thirteenth-century image now at the Metropolitan Museum of Art. [See image at right from the MET Museum; credits appear below.] Historical images of this saint can be found in large Hindu temples dedicated to Shiva in Tamil south India today, as well as in Hindu temples in countries where Tamils reside, such as Sri Lanka, South Africa, Fiji, and Western nations. Such images continue to be made today for both temple and personal worship collections. In addition, Cekkilar’s biography of Karaikkal Ammaiyar provides the narrative for annual festivals that publicly celebrate her devotion, including: 1) The festival to celebrate her achievement of spiritual liberation (mukti) at the Vadaranyeswarar Temple in Tiruvalankatu (also spelled Tiruvalangadu, about sixty km west of Chennai) every February–March; 2) The festival of the sixty-three saints (aruppattumūvar tiruvilā), held at the prestigious Kapaleeshvara (Kapālīśvara) Temple in Mylapore, Chennai every February–March; and 3) The mango festival (maṅgani tiruvi lā) to celebrate her life story at the temple town of Karaikal (about twenty km. north of Nagapattinam) every June–July. Today, Cekkilar’s biographical stories of the saints are widely known among Tamil speakers, especially those who identify as Shaiva. Indeed, the story of Karaikkal Ammaiyar is much more widely known than her own poetry. Her two hymns are known to some professional temple singers (ōtuvār) of Shiva-bhakti devotional hymns, but they are not part of the common performance repertoire. Cekkilar’s twelfth-century biographical volume of the saints, called the Periya Puranam (Periya Purāṇam; Great Traditional Story), has been enormously influential, and it predominates in guiding the Tamil public’s imagination of the sixty-three named saints’ identities today, as any number of books, articles and websites demonstrate. In the case of Karaikkal Ammaiyar, the biographical story is much more widely known than her own poetry. (For a detailed English translation of Karaikkal Ammaiyar’s biographical story, see Pechilis 2012:199-205. For a general English translation of the Periya Puranam see McGlashan 2006.) Yet there is a compelling reason to doubt an aspect of Cekkilar’s traditional memory, because the themes that he prioritizes in his biography, such as Karaikkal Ammaiyar’s identity as a wife, are not ones that are found in her own poetry and hymns. That is, Karaikkal Ammaiyar’s self-representation in her poetry in certain ways significantly differs from Cekkilar’s representation of her in his biography. It is thus necessary to start with Karaikkal Ammaiyar’s own poetry in order to discover the ways in which she represents herself in her compositions. The first thing to note is that there is a sharp bifurcation in her compositions. Her two poems, the 101-verse Arputat Tiruvantati (Sacred Linked Verses of Wonder; hereafter “Wonder”) and the twenty-verse TiruIrattai Manimalai (Sacred Garland of Double Gems; hereafter “Garland”), are similar in voice, theme and imagery in their reflections on devotion to Shiva. Her two hymns on Tiruvalankatu (Tiruvalankattut Tiruppatikam 1 and 2; hereafter “Decade-1” and “Decade-2”) are, however, quite distinct because of their sole concentration on Shiva as the Lord of Dance who performs at a cremation ground (Pechilis 2012:40-42). This difference will be explored in the sections below on Beliefs and Practices in this profile. and I reached your sacred henna-red feet. By not providing details about herself, the poet may have sought to present a universal voice in her poetry through which the devotional subjectivity she describes is accessible to all of humankind and not limited to people who match her own identity characteristics. Her voice is thus that of humanity as engaged in contemplation of the divine. A complicating factor is that three of her works, the “Wonder” and the two hymns on Tiruvalankatu, conclude with a signature verse in which the author refers to herself as Karaikkālpey (pēy), which translates to “the ghoul from the place named Karaikkal.” In all of her works, the poet describes ghouls (pey can be singular or plural) as frightening, capricious beings who attend Shiva’s dance at the cremation ground. Issues in understanding the poet’s adoption of pey as an identity marker are discussed in the section of this profile on Practices. But the devotional subjectivity Karaikkal Ammaiyar describes in the “Wonder” and the “Garland” is clearly that of a human being who desires to know Shiva. As her biographer, Cekkilar includes personal identifying information about Karaikkal Ammaiyar that the poetess herself leaves unspoken. According to him, she was born into a wealthy merchant family headed by her father Tanatattan in the town of Karaikkal (Tamils today understand “merchant” to suggest the Chettiar caste), and she was named Punitavati (Punitavati; “Pure One”). Beloved and beautiful, she exhibited devotion to Shiva from her youth; when she came of age her family arranged her marriage to Paramatattan, the son of a successful merchant named Nitipati. One day, Punitavati gave a Shaiva mendicant one of two mangoes that her husband had been saving, because the mendicant was hungry and she had not yet finished cooking lunch. Later, when her husband Paramatattan demanded even the second mango as his luncheon dessert, she appealed to Shiva to provide another. The husband tasted the difference between the first and second mango, and demanded to know the latter’s origin. When she explained, Paramatattan did not believe her and demanded yet another mango; Shiva provided it to her husband’s amazement, but it disappeared as Punitavati tried to hand it to her husband. Convinced that his wife was a capricious goddess, Paramatattan left her permanently under the guise of sailing on a trading journey. After some time, her relatives discovered his location and brought Punitavati to him. To their astonishment, Paramatattan, his new wife, and their daughter (whom he had named Punitavati) prostrated themselves before the original Punitavati, for in the ensuing years Paramatattan had come to reconsider his former wife to be a benevolent goddess. His former wife Punitavati then appealed to Shiva to release her from her beautiful body that she had maintained only for the sake of her husband, and grant her the body of a pey, which the text describes as a “body of bones” (vv. 50, 57; Pechilis 2012:203–04); upon this transformation she sang the “Wonder,” followed by the “Garland.” In this embodiment, she traveled to Shiva’s abode at Mount Kailash in the Himalayas, where she walked up the mountain on her hands. Shiva and his wife Parvati witnessed the unusual sight, and the Lord called out “Mother!” (ammai) to the pey, and she responded by addressing him as “Father” (appā). When the Lord graciously asked her what she desired, she answered: “May those who desire you with undying joyful love not be reborn; if I am born again, may I never forget you; may I sit at your feet, happily singing while you, virtue itself, dance” (vv. 59-60; Pechilis 2012, 204). Shiva directed her to the town of Alankatu (Tiruvalankatu) and promised she would witness his dance there. As she witnessed the beauty of his dance at Alankatu, she composed her two hymns (“Decade-1” and “Decade-2”). Cekkilar’s brilliant biography does many things. It provides a social context for the saint, enumerating conventional details of identification (caste, class, marital status) that arguably make the poet-saint more accessible to readers. It provides a rationale for calling her Karaikkal Ammaiyar, understood as a reference to her hometown and to Shiva’s address to her on Mount Kailash. It provides us with a glimpse of the circumscribing social expectations for women, especially through its emphasis on propriety, while at the same time it asserts that a woman can become a religious exemplar of supreme devotion to Shiva (Pechilis 2014; 2012: 82–105). It provides a chronology and event contexts in which to locate her compositions. It provides an interpretation of her embodiment as a pey: It is her own wish, expressed to Shiva in response to her husband’s actions, to renounce her youthful body and become a “body of bones.” While the biography creatively deploys images and themes from Karaikkal Ammaiyar’s own poetry, it remains quite distinct from her poetry. Most glaringly, the biography represents the poet as becoming alienated from other people: Her husband leaves her, her transformation to a pey is a miraculous occurrence, people are frightened by her appearance as a pey, she travels by herself to Mount Kailash, and she alone witnesses Shiva’s dance at Tiruvalankatu. Cekkilar promotes the singularity of Karaikkal Ammaiyar; in contrast, in her own poetry she asserts her common humanity and instead promotes the singularity of Shiva. Karaikkal Ammaiyar’s poetry describes a devotional subjectivity that is fully engaged with Shiva. Hers is an exploratory attempt to experience affectively the mystical connection between the divine and the human (Pechilis 2013, 2016c), and as such, in her compositions she reflects on both the nature of the divine and the nature of the human self, often raising questions rather than providing answers. One way of interpreting her corpus is to note five major themes in her compositions. 1) Being a servant. In several of her “Wonder” and “Garland” verses, the poet identifies herself as a “servant” (āḷ) to Shiva, or refers to “servants” in the plural, or speaks of performing service to Shiva. If Karaikkal Ammaiyar was indeed the first Shiva-bhakti poet, as tradition claims and scholarship to date supports, then she was the first to establish what became a signature identity, that of servant, in Tamil devotional poetry. 2) The Heroic Lord. The hierarchy inscribed in the devotional subjectivity of “servant” is reflected in the intensely visual verses that describe Shiva as a heroic lord, such as the poems already provided earlier in this profile. These verses, found in her “Wonder” and “Garland” poems, draw on the heroic deeds of Shiva known from Sanskrit mythology. Karaikkal Ammaiyar especially favors the image of Shiva as the Swallower of Poison as well as the form of Shiva as the Bearer of Ganga. As the former, Shiva swallowed the poison that unexpectedly emerged as the gods and demons churned the ocean of milk in primordial times in order to create the elixir of immortality; his neck bears a blue-black stain from this event. As the Bearer of Ganga, Shiva allowed the celestial Ganga (Ganges) River to come to earth to reward his devotee, but her power was such that she would destroy the earth if she fell on it unobstructed; Shiva compelled the river to pass through his convoluted matted locks, and a gentle stream became the Ganga River on earth. Memorializing this event, Shiva wears a tiny icon of the goddess Ganga in his matted locks. Both of these images feature Shiva as a protector deity whose body is marked with a symbol of these heroic deeds. Karaikkal Ammaiyar also frequently praises Shiva as the Destroyer of the Triple Cities, referring to when he lethally pierced the demonic cities with a single flaming arrow. Her hymns on Tiruvalankatu (“Decade-1” and “Decade-2”) exclusively praise the Shiva as the Dancer, which is discussed under the theme of The Other Side below. 3) Questions. Karaikkal Ammaiyar asks many demanding questions of Shiva, seemingly undermining the hierarchy of lord and subject that the servant identity and praise of the heroic lord would suggest. In “Wonder” and “Garland,” she asks about the god’s many forms and what they mean. She also asks why she is still suffering from life’s afflictions and why Shiva has not favored her with his grace. These questioning verses, found throughout her two poems, describe the oscillation of her devotional subjectivity—her relationship with Shiva is not settled but is instead a fluid and changing one, with the devotee sometimes feeling assurance and sometimes feeling anxious and puzzled. This oscillation was to become a hallmark of bhakti poetry. 4) The Other Side. In this category are verses in the “Wonder” and the “Garland” that speak of Shiva as frightening to some, who are usually described as “others.” The poetess at times asks Shiva to remove fright-inducing emblems, such as replacing the cobra that he wears across his chest with a gold necklace, so that he more conventionally represents benevolence to onlookers. Other verses in this category describe those who are hostile to the worship of Shiva; perhaps these are the same people who would be frightened by his emblems. Yet the poet also insists that a prominent and powerful form of Shiva is as a dancer in the cremation ground at midnight; this image, while mentioned in the “Wonder” and the “Garland,” is the sole image of the Lord in her two hymns on Tiruvalankatu. 5) Assurances. Many of Karaikkal Ammaiyar’s verses indicate that she considers herself and all other servants of Shiva to have received his grace as salvation from their sorrows, including the sorrow of rebirth (the cycle of sasāra) based on their own actions (the law of karma). Such verses are interspersed throughout the “Wonder” and the “Garland,” creating the sense of oscillation between assurance and anxiety characteristic of bhakti poetry. However, the final verses, known as a signature verse, found at the conclusion of the “Wonder” as well as her two hymns on Tiruvalankatu, offer a concluding reassurance that devotion to Shiva results in spiritual salvation. Karaikkal Ammaiyar’s devotional priority was to keep Shiva always in mind. Her poetry does not describe the performance of rituals to Shiva, but instead urges humankind to focus on contemplating his form, nature, essence and power. Her compositions provide hearers or readers with the means to such contemplation, and her signature verses, found at the end of the “Wonder” and her two hymns on Tiruvalankatu, urge hearers or readers to recite her own verses in order to reach Shiva and experience bliss and salvation. Her two hymns on Tiruvalankatu, however, provide a distinctive dimension to experiencing Shiva: They read as an eyewitness account of Shiva’s dance in the cremation ground. The scene is portrayed as forbidding, with the Lord dancing at midnight in the glow of a funeral pyre that barely illuminates the desolate theatre encircled by thickets of dried and inhospitable plants. Birds of prey and scavenger animals wander at will, screeching and howling their presence. Pey (ghouls), who are known from Sanskrit mythology to be a motley crew of misshapen beings who serve as Shiva’s dedicated attendants, appear here and there, consumed with their own frightful activities. in which they eat the flesh of burned corpses. And yet the observer, “Karaikkal pey” as she self-identifies in each of the two signature verses to the Tiruvalankatu hymns, remains there in that eerie place. Was she herself a pey? Those who believe so point to the first verse of “Decade-1,” which is a third-person description of a female pey , limning her form as hollowed and bony. This verse could have inspired her biographer Cekkilar, who depicted Karaikkal Ammaiyar as undergoing a bodily transformation into a “bag of bones,” as well as icon makers who created metal images of her with such characteristics to be carried in religious festival processions. While this predominant interpretation is plausible, there is a problem with it insofar as Karaikkal Ammaiyar’s hymns depict the pey as instinctual beings that do not have refined language, which is the antithesis of the devotional subjectivity Karaikkal Ammaiyar describes in the “Wonder” and the “Garland.” This would suggest that she joins the pey at the cremation ground to witness Shiva’s dance, but she does not become a pey herself. It is plausible that in journeying to and remaining at the socially shunned cremation ground at night Karaikkal Ammaiyar chose to appropriate and transform for her own devotional path then-current Tantric practices, which involved going to the cremation ground to become like Shiva (Pechilis 2016a). In Karaikkal Ammaiyar’s hymns, she encounters Shiva himself there, instead of becoming like Shiva. Her hymns suggest that a devotional subjectivity leads to a transformation of consciousness that enables the devotee to appreciate all aspects of the divine, including his awesome power over life and death. Taken as a whole, Karaikkal Ammaiyar’s compositions affirm that visceral knowledge of the finitude of the human lifespan compels one to live life as fully as possible in expressed dedication and service to Shiva. One of the major challenges in studying Karaikkal Ammaiyar is to discern her perspective from her own poetry, separate and apart from the hegemony of her biographer Cekkilar’s description of her life. Such a study, to date infrequently undertaken, reveals that the poet had very distinctive humanistic priorities in her creation of a devotional subjectivity. A second challenge is to more completely understand the early medieval historical context of Karaikkal Ammaiyar, including political history (Ali 2004) as well as literary and religious history. A third challenge is to understand in scholarly and historical detail Karaikkal Ammaiyar’s influence and legacy in subsequent developments in Tamil Shiva-bhakti . A fourth challenge is to integrate Karaikkal Ammaiyar’s voice into global knowledge of both women’s history and feminist history (Pechilis 2014). Image #1: Shiva as Nataraja on the western corner of the southern wall of the temple at Gangaikondacholapuram, India eleventh century. 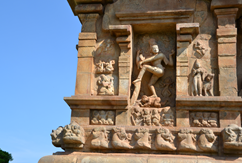 Karaikkal Ammaiyar is to the viewer’s left on the frieze below the Nataraja, seated with three of Shiva’s bhutaganas. She is depicted playing cymbals to Shiva’s dance. Photo taken by and © the author. Image 2: Detail of Image 1. Photo taken by and © the author. Image #3: Karaikkal Ammaiyar. India Chola Dynasty bronze ca. late thirteenth century, approx. nine inches height. MET Museum collection, www.metmuseum.org. Image #4: Shiva Nataraja. India Chola Dynasty bronze ca. eleventh century, approx. twenty-seven inches height. MET Museum collection, www.metmuseum.org. Ali, Daud. 2004. Courtly Culture and Political Life in Early Medieval India. Cambridge: Cambridge University Press. Craddock, Elaine. 2010. Śiva’s Demon Devotee: Kāraikkāl Ammaiyār. Albany: State University of New York Press. Cutler, Norman. 1987. Songs of Experience: The Poetics of Tamil Devotion. Bloomington: Indiana University Press. Dehejia, V. 1988. Slaves of the Lord: The Path of the Tamil Saints. New Delhi: Munshiram Manoharlal. Filliozat, Jean. 1982 . “Introduction.” Pp. 1-14 in Chants dévotionnels tamouls de Kāraikkālammaiyār, ed. and trans. Kārāvelāne. Pondichéry: Institut Français d’Indologie. Hart, George L., and Hank Heifetz. 1999. The Four Hundred Songs of War and Wisdom: The Puranānūru. New York: Columbia University Press. Kaimal, Padma. 1999. 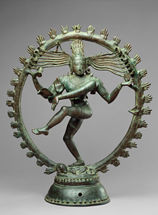 “Shiva Nataraja: Shifting Meanings of an Icon.” The Art Bulletin 81:390–419. Kārāvelāne. 1982a . “Avant-Propos.” Pp. 17-19 in Chants dévotionnels tamouls de Kāraikkālammaiyār, ed. and trans. Kārāvelāne. Pondichéry: Institut Français d’Indologie. Mahalakshmi, R. 2011. The Making of the Goddess: Korravai-Durgā in the Tamil Traditions. New Delhi: Penguin. Mahalakshmi, R. 2000. “Outside the Norm, Within the Tradition: Kāraikkāl Ammaiyār and the Tradition of Tamil Bhakti.” Studies in History 16, no. 1: 19–40. McGlashan, Alastair. 2006. The History of the Holy Servants of the Lord Siva: A Translation of the Periya Purāṇam of Cēkkilār. Oxford: Trafford Publishing. Nilakanta Sastri, K. A. 1955. A History of South India: From Prehistoric Times to the Fall of Vijayanagar. Madras: Oxford University Press. Pechilis, Karen. 2016a. “Bhakti and Tantra Intertwined: The Exploration of the Tamil Poetess Kāraikkāl Ammaiyār.” International Journal of Dharma Studies 4, no. 2 (February 2016). Accessed from http://internationaljournaldharmastudies.springeropen.com/articles/10.1186/s40613-016-0024-x on 10 April 2016. Pechilis, Karen. 2016b. “The Siva Nataraja Image: Poetic Origins.” Kalakshetra Journal 4:1-16. Pechilis, Karen. 2016c. 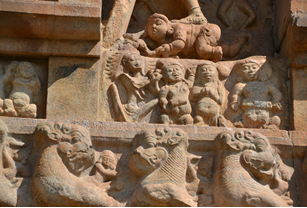 “To Body or Not to Body: Repulsion, Wonder and the Tamil Saint Kāraikkāl Ammaiyār.” In Re-Figuring the Body: Embodiment in South Asian Religions, edited by Barbara A. Holdrege and Karen Pechilis, in press. Albany: State University of New York Press. Pechilis, Karen. 2014. “Devotional Subjectivity and the Fiction of Femaleness: Feminist Hermeneutics and the Articulation of Difference.” Journal of Feminist Studies in Religion 30:99–114. Pechilis, Karen. “ Śiva as the Lord of Dance: What the Poetess Saw.” Journal of Hindu Studies 6:131–53. Pechilis, Karen. 2012. Interpreting Devotion: The Poetry and Legacy of a Female Bhakti Saint of India. London: Routledge. Sanderson, Alexis. 2009. “The Śaiva Age: The Rise and Dominance of Śaivism during the Medieval Period.” Pp. 41-350 in Genesis and Development of Tantrism, edite by Shingoo Einoo. Institute of Oriental Culture Special Series 23. Tokyo: Institute of Oriental Culture, University of Tokyo. Accessed from http://www.alexissanderson.com/uploads/6/2/7/6/6276908/sanderson_2009_the_saiva_age.pdf on 10 April 2016. Zvelebil, Kamil. 1973. The Smile of Murugan: On Tamil Literature of South India. Leiden: E. J. Brill.